Ashley Murray (b.1987), king marina shells, Wynyard 2016. Image courtesy Tasmanian Museum and Art Gallery. kanalaritja: An Unbroken String is a touring exhibition and series of workshops at The Leo Kelly Blacktown Arts Centre, that celebrates the Tasmanian Aboriginal cultural practice of shell-stringing, and the generations of makers who have sustained the tradition. Touring throughout Australia from the Tasmanian Museum and Art Gallery (TMAG), the exhibition features shell necklaces created by Tasmanian Aboriginal Ancestors in the 1800s, and acclaimed makers of today, as well as a new wave of stringers who had the opportunity to learn the tradition. 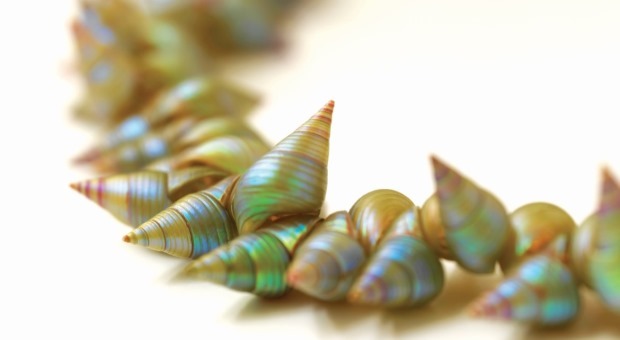 The practice of shell stringing celebrates culture and symbolises identity – it is an unbroken string connecting Tasmanian Aboriginal communities to their ancestors, their culture and their country. Master weavers Steven Russell and Phyllis Stewart will present a number of workshops in March and April, in conjunction with the exhibition – book here.